Everything in this is AWESOME. Finally, a fun family movie, not without it’s imperfections, but enjoyable none the less. 3D makes certain scenes stand out but not a MUST. Apart from that, the makers behind the equally brilliant Cloudy With A Chance of Meatballs have assembled a hit. 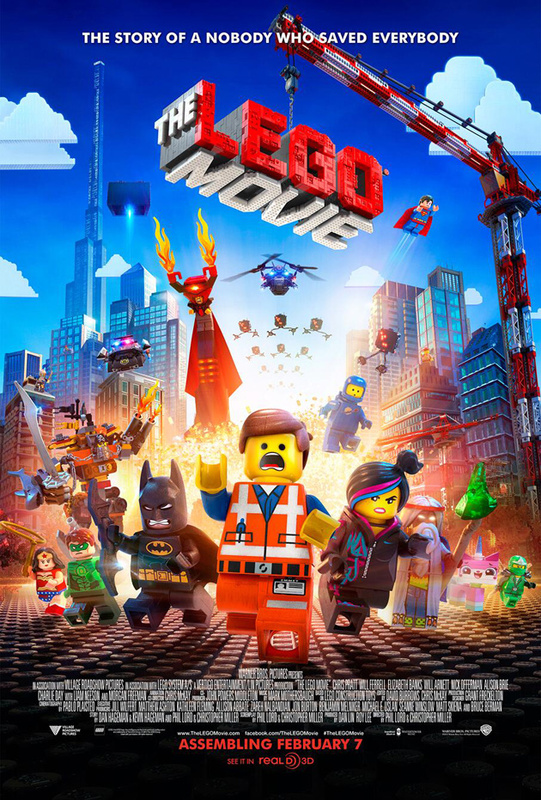 Basically, the plot follows Emmet (Chris Pratt), an oblivious construction worker who is mistaken for the ‘most extraordinary person’ in all of the LEGO universe, and according to an old prophecy, must defeat the evil tyrant with the best bad guy name . . . Lord Business (That one got a tweet out of Michael Moore), voiced by the legend that is Will Ferrell, who is plotting to destroy the world with his secret weapon, the Kragle (brilliant. When you see what it is). The animation is brilliant, considering it is LEGO. The detail and the fun it pokes at the limited movements of the LEGO pieces is hilarious. The fact they make great expressions with their little black eyes is nicely done and the action pieces although rapid are great to watch. The cast are fantastic. Chris Pratt is on form as naive dimwit Emmet. Morgan Freeman providing his infamous voice and gravitas to the senial wizard Vitruvius. Will Ferrell grumbling and picking at the craziness of it all as the sinister Lord Business, President of the Octan Corporation . . . and the entire world. Elizabeth Banks as the loveable rogue Wyldstyle who is tasked with protecting Emmet (“Come with me with you wanna NOT die”). However, cudos must be awarded to the supporting characters. Will Arnett’s (The Millers, Arrested Development) LEGO Batman is hilarious. His dark love song being a personal highlight. Charlie Day (Horrible Bosses) as Benny, the bonkers 80s LEGO astronaut guy (SPACESHIP!). Alison Brie (Trudy from Mad Men?!) as the bi-polar Unikitty, who unhealthily bottles up her negative thoughts and last not but least, “I don’t have much money, but particular skills legend” that is Liam Neeson as the two faced good cop, bad cop was fantastic. Such a surprise to see the huge cast attached to this and that they can all poke fun at themselves. Don’t look at IMDb if you want to guess them. There was an unexpected twist near the end that dipped the film a little bit. It worked but I couldn’t help but feel that it was a slight rip off of another animated hit, hint hint, cough, The Spongebob Squarepants Movie. As usual, some of the better bits are in the trailer. But it zips along at a great pace, keeping it light and fun. I was impressed with the clever satire they put in as well. The fact that Emmet is completely unaware he is under the rule of a dictatorship with propaganda everywhere. Most annoyingly so, in the incredibly catchy song Everything is Awesome by Tegan and Sara featuring the Lonely Island. 3D is not neccesarily an investment for this. A couple of bits stand out with the lasers and machinery but not a must. The animation would look just as good as in 2D. Do you like Lego? Do you like the games? Then this is for you. Is it fun? Absolutely. One the family will enjoy? I don’t see why not. Hardly a classic but a fresh take that stands out from the churned out family movies these last few years. Get on it. 4 pieces (just) out of 5! Currently ranks #25 out of 141!